Northwest Arkansas Fitness & Health Association is a group of committed volunteers dedicated to promoting fitness & health to everyone. The founder, Joe Wilson is a high school math teacher in the Bentonville School district. Joe has dedicated his a large amount of his time, talents and efforts support the mission of the organization and promote fitness & health for everyone… including kids, where the knowledge and healthy lifestyle should start. His vision is to have kids become better students in the classroom and in the aspects of fitness, intelligence, social interaction, better self esteem, be better goal setters, grow stronger in their faith, and a way to prevent diet related health issues. For us to do this as a community, we are always looking for members to help us share our mission, accomplish our vision, and satisfy our goal… to reach every school in NWA and help focus on better lifestyle choices. We have 3 pillars we focus on, when dealing with fitness and health. 1. 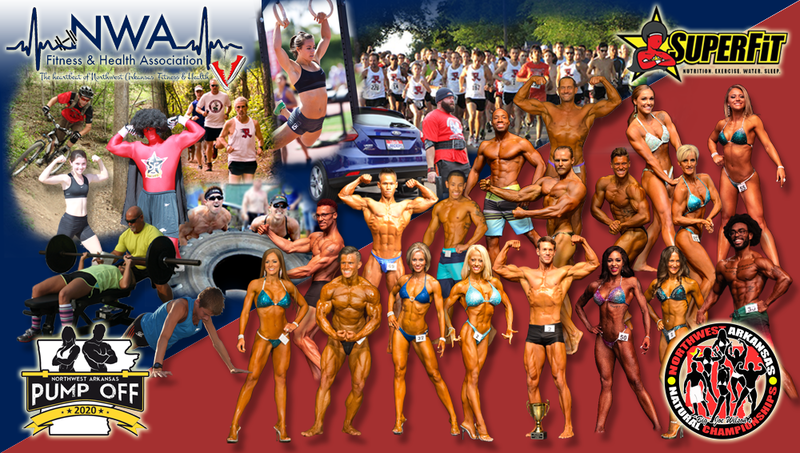 Fitness Clearinghouse and Fitness Professionals. We want to showcase every fitness facility and professional in NWA and allow these businesses to get more exposure to the younger generation by partnering with us in the SuperFit Campaign and on our website along with the sharing of the good N.E.W.S..
2. Fitness Competitions. We want everyone to know about competitions taking place locally; from 5K’s, half marathons, fencing tournaments, strongman competitions, bodybuilding competitions, triathlons, mud runs/obstacle course runs, swim meets, MMA/karate tournaments … basically competitions where people train for a one day event. So if you know of an event we can put on our calendar, let us know about it! 3. The SuperFit Campaign of sharing the good N.E.W.S. This is our acronym of living a healthy lifestyle; N.E.W.S. = Nutrition, Exercise, Water, Sleep. Also, in this campaign, we want to share some of the good N.E.W.S. that the scriptures has in the Bible dealing with fitness and health for the body and mind. Each month, we send a N.E.W.S.Letter with these components and hope to change the lives of anyone who wants to experience this journey for the better. It won’t be easy, but the reward is very attainable. See who we are and a bit of our background.